An overhead view of the 3D restoration of Antioch has been mapped over the location of the city on the globe. 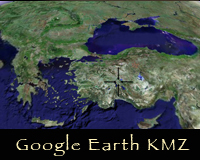 In order to use this feature, you must have the free Google Earth ® browser installed on your computer. The first-known and best-preserved of Antioch's aqueducts can be seen running NE from the city as a thin black line. The city immediatly to the west of Antioch is modern Yalvac, Turkey. This feature can be use over dial-up, but will take at least 5-15 minutes to load the textures and terrain.